For grizzly beards. Blend of natural oils. Fast absorbing and ultra light. 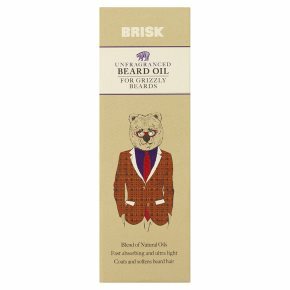 Coats and softens beard hair.Beard Oil from Brisk is designed to coat, soften & tame the grizzliest of beards. This fast absorbing beard oil will help to hydrate your hair, make your skin feel less dry & itchy, leaving you looking well groomed. Directions for use: Drop the desired amount of oil into palm. Rub hands together and apply evenly to facial hair and skin underneath. For best results, use regularly. Take care: Avoid contact with eyes. If this happens rinse thoroughly with clean water.